The ability to record neural activity in the brain of a living organism at cellular resolution is of great importance for defining the neural circuit mechanisms that direct behavior. Here we present an adaptive two-photon microscope optimized for extraction of neural signals over volumes in intact Drosophila brains, even in the presence of specimen motion. High speed volume imaging was made possible through reduction of spatial resolution while maintaining the light collection efficiency of a high resolution, high numerical aperture microscope. This enabled simultaneous recording of odor-evoked calcium transients in a defined volume of mushroom body Kenyon cell bodies in a live fruit fly. T.-W. Chen, T. J. Wardill, Y. Sun, S. R. Pulver, S. L. Renninger, A. Baohan, E. R. Schreiter, R. A. Kerr, M. B. Orger, V. Jayaraman, L. L. Looger, K. Svoboda, and D. S. Kim, “Ultrasensitive fluorescent proteins for imaging neuronal activity,” Nature 499(7458), 295–300 (2013). N. Ji, J. Freeman, and S. L. Smith, “Technologies for imaging neural activity in large volumes,” Nat. Neurosci. 19(9), 1154–1164 (2016). W. Yang and R. Yuste, “In vivo imaging of neural activity,” Nat. Methods 14(4), 349–359 (2017). M. B. Bouchard, V. Voleti, C. S. Mendes, C. Lacefield, W. B. Grueber, R. S. Mann, R. M. Bruno, and E. M. C. Hillman, “Swept confocally-aligned planar excitation (SCAPE) microscopy for high speed volumetric imaging of behaving organisms,” Nat. Photonics 9(2), 113–119 (2015). R. Prevedel, Y.-G. Yoon, M. Hoffmann, N. Pak, G. Wetzstein, S. Kato, T. Schrödel, R. Raskar, M. Zimmer, E. S. Boyden, and A. Vaziri, “Simultaneous whole-animal 3D imaging of neuronal activity using light-field microscopy,” Nat. Methods 11(7), 727–730 (2014). K. M. N. S. Nadella, H. Roš, C. Baragli, V. A. Griffiths, G. Konstantinou, T. Koimtzis, G. J. Evans, P. A. Kirkby, and R. A. Silver, “Random-access scanning microscopy for 3D imaging in awake behaving animals,” Nat. Methods 13(12), 1001–1004 (2016). G. Szalay, L. Judák, G. Katona, K. Ócsai, G. Juhász, M. Veress, Z. Szadai, A. Fehér, T. Tompa, B. Chiovini, P. Maák, and B. Rózsa, “Fast 3D Imaging of Spine, Dendritic, and Neuronal Assemblies in Behaving Animals,” Neuron 92(4), 723–738 (2016). S. Quirin, J. Jackson, D. S. Peterka, and R. Yuste, “Simultaneous imaging of neural activity in three dimensions,” Front. Neural Circuits 8, 29 (2014). E. J. Botcherby, C. W. Smith, M. M. Kohl, D. Débarre, M. J. Booth, R. Juškaitis, O. Paulsen, and T. Wilson, “Aberration-free three-dimensional multiphoton imaging of neuronal activity at kHz rates,” Proc. Natl. Acad. Sci. U.S.A. 109(8), 2919–2924 (2012). B. F. Grewe, F. F. Voigt, M. van ’t Hoff, and F. Helmchen, “Fast two-layer two-photon imaging of neuronal cell populations using an electrically tunable lens,” Biomed. Opt. Express 2(7), 2035–2046 (2011). L. Kong, J. Tang, J. P. Little, Y. Yu, T. Lämmermann, C. P. Lin, R. N. Germain, and M. Cui, “Continuous volumetric imaging via an optical phase-locked ultrasound lens,” Nat. Methods 12(8), 759–762 (2015). G. J. Brakenhoff, J. Squier, T. Norris, A. C. Bliton, M. H. Wade, and B. Athey, “Real-time two-photon confocal microscopy using a femtosecond, amplified Ti:sapphire system,” J. Microsc. 181(3), 253–259 (1996). P. S. Salter, Z. Iqbal, and M. J. Booth, “Analysis of the Three-Dimensional Focal Positioning Capability of Adaptive Optic Elements,” Int. J. Optomechatronics 7(1), 1–14 (2013). H. Dana, N. Kruger, A. Ellman, and S. Shoham, “Line temporal focusing characteristics in transparent and scattering media,” Opt. Express 21(5), 5677–5687 (2013). E. Tal, D. Oron, and Y. Silberberg, “Improved depth resolution in video-rate line-scanning multiphoton microscopy using temporal focusing,” Opt. Lett. 30(13), 1686–1688 (2005). R. Prevedel, A. J. Verhoef, A. J. Pernía-Andrade, S. Weisenburger, B. S. Huang, T. Nöbauer, A. Fernández, J. E. Delcour, P. Golshani, A. Baltuska, and A. Vaziri, “Fast volumetric calcium imaging across multiple cortical layers using sculpted light,” Nat. Methods 13(12), 1021–1028 (2016). A. Bègue, E. Papagiakoumou, B. Leshem, R. Conti, L. Enke, D. Oron, and V. Emiliani, “Two-photon excitation in scattering media by spatiotemporally shaped beams and their application in optogenetic stimulation,” Biomed. Opt. Express 4(12), 2869–2879 (2013). C. Boudreau, T. L. Wee, Y. R. Duh, M. P. Couto, K. H. Ardakani, and C. M. Brown, “Excitation Light Dose Engineering to Reduce Photo-bleaching and Photo-toxicity,” Sci. Rep. 6(1), 30892 (2016). W. J. Shain, N. A. Vickers, B. B. Goldberg, T. Bifano, and J. Mertz, “Extended depth-of-field microscopy with a high-speed deformable mirror,” Opt. Lett. 42(5), 995–998 (2017). I. Powell, “Linear deiverging lens,” U.S. patent 4,826,299, (1989). J. K. Park, C. J. Rowlands, and P. T. C. So, “Enhanced Axial Resolution of Wide-Field Two-Photon Excitation Microscopy by Line Scanning Using a Digital Micromirror Device,” Micromachines (Basel) 8(3), 85 (2017). A. Jesacher and M. J. Booth, “Sensorless adaptive optics for microscopy,” in Adaptive Optics for Biological Imaging, J. Kubby, ed. (CRC Press, 2013), pp. 177–189. 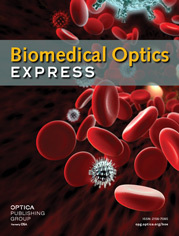 R. Juškaitis, “Measuring the Real Point Spread Function of High Numerical Aperture Microscope Objective Lenses BT - Handbook Of Biological Confocal Microscopy,” in Handbook of Biological Confocal Microscopy: Third Edition, J. B. Pawley, ed., 3rd ed. (Springer US, 2006), pp. 239–250. T. E. Gureyev and K. A. Nugent, “Phase retrieval with the transport-of-intensity equation. II. Orthogonal series solution for nonuniform illumination,” J. Opt. Soc. Am. A 13(8), 1670–1682 (1996). M. Booth, T. Wilson, H. B. Sun, T. Ota, and S. Kawata, “Methods for the characterization of deformable membrane mirrors,” Appl. Opt. 44(24), 5131–5139 (2005). Y. Shang, A. Claridge-Chang, L. Sjulson, M. Pypaert, and G. Miesenböck, “Excitatory Local Circuits and Their Implications for Olfactory Processing in the Fly Antennal Lobe,” Cell 128(3), 601–612 (2007). J. L. Pitman, W. Huetteroth, C. J. Burke, M. J. Krashes, S.-L. Lai, T. Lee, and S. Waddell, “A Pair of Inhibitory Neurons Are Required to Sustain Labile Memory in the Drosophila Mushroom Body,” Curr. Biol. 21(10), 855–861 (2011). S. R. Schultz, K. Kitamura, A. Post-Uiterweer, J. Krupic, and M. Häusser, “Spatial Pattern Coding of Sensory Information by Climbing Fiber-Evoked Calcium Signals in Networks of Neighboring Cerebellar Purkinje Cells,” J. Neurosci. 29, 8005–8015 (2009). E. A. Mukamel, A. Nimmerjahn, and M. J. Schnitzer, “Automated Analysis of Cellular Signals from Large-Scale Calcium Imaging Data,” Neuron 63(6), 747–760 (2009). P. Rupprecht, R. Prevedel, F. Groessl, W. E. Haubensak, and A. Vaziri, “Optimizing and extending light-sculpting microscopy for fast functional imaging in neuroscience,” Biomed. Opt. Express 6(2), 353–368 (2015). Nadella, K. M. N. S.
Fig. 1 (a) Simplified schematic diagram of the AO-VAST microscope configured for in vivo imaging. (b) Illumination line exciting two-photon fluorescence in a fluorescent polymer slide indicating the shape of line illumination profile. (c) Axial profile of the excitation PSF obtained by recording fluorescence intensity when a thin layer of fluorescent dye is scanned through object plane (d) A single imaging plane obtained by laterally scanning an excitation line across a fluorescent plastic slide. (e) Volumetric imaging strategy: each optical slice is formed by scanning a line along the image plane; scanning along the optical axis is enabled by a deformable mirror. (f) Expanded 3D image of a pollen grain: the whole volume consisting of ten z-slices, each of thickness ~5 μm, was captured in 10 ms. (g) Wavefront root mean square error (RMSE) in radians for optical wavefront when remotely focusing to different axial positions. Data points are fitted with a 2nd order polynomial. In (b) and (d) the scale bar corresponds to 10 micrometers. Fig. 2 Detailed schematic of the optical set-up. O and O’ indicate object and conjugate object planes, while P and P’ indicate optical system pupil planes. The microscope can be switched to wavefront sensing mode by lowering two flip mirrors and raising a flip mounted pellicle beam splitter. (b) Photograph of the set-up. The shaded region masks instruments used for electrophysiology and odor delivery. Fig. 3 Flowchart outlining the TIE based phase retrieval for deformable mirror calibration. For the wavefront sensing, an optical pupil is evenly illuminated and the intensity maps of the light propagating through the system is captured at the plane at the slightly defocused position δz away from the conjugate pupil plane. The M matrix and the scaling factor NF are determined by system parameters (δz defocus distance, λ central illumination wavelength and R the radius of the optical pupil) and by the orthogonal mode set chosen for the wavefront decomposition (Zernike modes in this instance). Calculation of the M matrix is the most computationally intensive step and can be done in advance. During the wavefront sensing the difference between the images taken with a flat reference wavefront and with distorted wavefront is decomposed into chosen set of orthogonal modes Zn and used as the input for the final equation Zphase = NF*Minv⋅Zn. Fig. 4 Flowchart outlining mirror training for the remote focusing algorithm. Fig. 5 Fast imaging of a pollen grain: the whole volume consisting of ten z-slices, each of thickness ~5 μm, was captured in 10 ms. The scale bar corresponds to 10 micrometers. Fig. 6 Imaging odor responses in a live fruit fly brain expressing GCaMP6f in mushroom body Kenyon Cells. (a) Image of Kenyon Cell bodies with system flat correction. Scale bar corresponds to 10 micrometers. (b) AO correction of sample induced aberrations leads to sharper images and increased image brightness. (c) Comparison of raw images acquired with and without correction of sample induced aberrations. AO correction leads to increased signal to noise ratio, permitting faster imaging. (d) Independent components extracted from a recorded video (Visualization 1) and ∆F/F responses corresponding to each independent component. Green, purple and grey color bars represent the time periods where the fly was exposed to IAA, MCH and OCT odors. (e) Averaged recording of Kenyon Cells expressing GCaMP6f representing cumulative fluorescence throughout full odor delivery sequence. Each image going from left to right corresponds to a 50 × 80 μm consecutive z-slice separated by 5 μm. (f) A composite image where different colors correspond to spatial filters 1,3,4,5,6 in (d) 3D rendering is also available in Visualization 3.